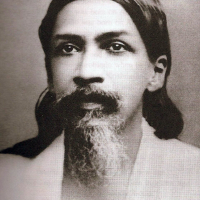 Sri Aurobindo was an Indian philosopher, yogi, guru, poet, and nationalist.He joined the Indian movement for independence from British rule, for a while was one of its influential leaders and then became a spiritual reformer, introducing his visions on human progress and spiritual evolution. He believed in a spiritual realisation that not only liberated man but transformed his nature, enabling a divine life on earth. In 1926, with the help of his spiritual collaborator, Mirra Alfassa (referred to as "The Mother"), he founded the Sri Aurobindo Ashram.He was nominated for the Nobel Prize in Literature in 1943 and the Nobel Peace Prize in 1950.